Earlier this year we brought you a new lace design – the Bounce Blanket. We included instructions on how to work a swatch and determine your gauge over lace in the pattern, but we thought we might elaborate on measuring gauge over lace here! The Bounce Blanket is knit in an ombre of mini-skeins from Rainbow Heirloom. Work a swatch which is a number of pattern repeats wide, at least the number you think will give you a swatch 4-6 inches wide and tall. If you are confused about pattern repeats, review our tutorial on reading knitting charts. Take care to cast on and bind off quite loosely, which will allow the swatch to block out properly. It’s not as important as your gauge after blocking, but I suggest you measure gauge before blocking, taking note of stitch and row gauge. This is your ‘unblocked gauge’. To measure gauge in lace, I find it most useful to mark points in the pattern which repeat. For example, if there is a central line vertical line, mark it with a pin, then mark the same spot one or two or three repeats to the left or right. Measure the distance between the pins accurately, and take note of it. Then divide the number of stitches you know are in the repeats by the distance (inches). In the example shown below, you’d measure the distance (we’ll say it was 6″), then divide the 24 sts by 6″… 24 sts/6″ = 4 sts per inch. If you multiply this by 4 you get 16 sts in 4″, the distance over which gauge is typically stated. This example is from the free Gothic Lace Scarf (or cowl) pattern, which has a 8 stitch and 12 row repeat pattern. For more info check out the full tutorial. Use the same method to determine row or round gauge. Choose a clear point in the pattern (for example the top point of a lace leaf), and mark it with a pin. Then mark the same point one, two, or more repeats up or down from this point. Measure the distance and divide the number of rows by this distance. If the distance in the example above was 4.25″ for example, then we would divide the rows (24) by 4.25″ = 5.65 rows per inch, or 22.5 rows / 4″. The gauge for the unblocked sample above would be stated as 16 sts & 22.5 rows / 4″. Wet block the swatch in the same way you would the final lace piece, allowing it to dry fully before unpinning. We’ve got tutorials on the basics of blocking, and how to block a lace shawl that you may want to review. Finally, measure the blocked gauge, following the same steps as above. The blocked gauge is the important one, since your finished item will be blocked; so you should swatch until you’ve achieved the gauge called for by the pattern. Once you determine the finished gauge that you’ve achieved in your swatch, you can determine whether to proceed with the project on the same needles, or adjust to a larger needle size for larger stitches (and a smaller sts / 4” number) or a smaller size for smaller stitches (a larger sts / 4” number). With a large-scale lace panel, the Redcedar stole gives a gauge measurement by listing the finished size of the panel, rather than gauge over 4 inches. This version is knit in Rainbow Heirloom Brit Aran in ‘apparition’. Some patterns (the Redcedar stole for example) will list gauge in a different way, by giving the finished size of a lace repeat rather than a number in sts per inch or sts per 4″. The pattern states that the lace panel, 19 sts wide by 42 rows long, should measure 6.5″ wide by 7.5″ long after blocking. 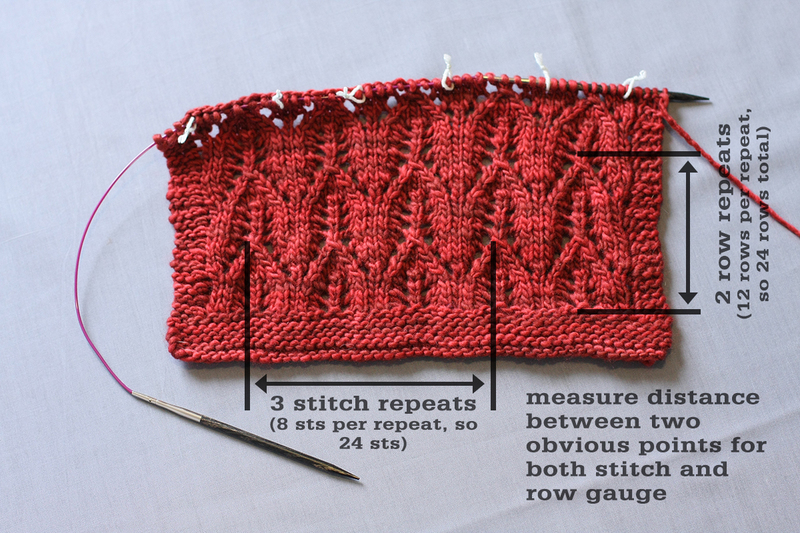 In order to work a gauge swatch in this case, you would work the 19 stitch panel (plus a few edge sts each side) for at least 42 rows, wet block and dry the swatch, then measure to see whether it does in fact measure as stated. From there you’d adjust to larger or smaller needles as required or desired. Thankfully, often with lace, gauge doesn’t matter too much, because we often see lace in shawls, stoles, blankets, and accessories where fit doesn’t matter so much. The Lodestar, Estuary, Photosynthesis, Botany, Sunflower Shawls and Vivid blanket are some great flexible lace designs by Tin Can Knits. However if you are making an all-over lace garment, and you wanted the fit to be ‘per design’ you’d want to take care to check your gauge in pattern. What if you can’t make both stitch gauge AND row gauge match the gauge stated in the pattern, no matter what needle size you use? It is generally most crucial to achieve the stated stitch gauge in order to get a finished knit of similar size to the pattern sample. For example, to achieve a bust size of 40”, you must work at the correct stitch gauge. Row gauge is generally less important (although there are exceptions to this rule! ), as you can simply knit the body of a garment longer or shorter, and pattern instructions often give knit-to lengths in inches, rather than specifying row counts. However, keep in mind that if your row or round gauge is significantly different than that given by the pattern, this will effect the yardage requirements. Read our separate tutorial dedicated to row gauge here. I know this is an old post, but I just found it when I searched for “measuring lace gauge.” Thank you for this clear and detailed description of how to measure gauge in lace knitting. This is something I’ve tried to figure out in the past and wasn’t very successful at (and truthfully it didn’t matter because I was mostly making scarves, cowls, etc. where gauge wasn’t critical) This post provides such a clear and simple way to measure. Now I can make the all over lace sweater I’ve been drooling over and it will fit because I know how to more accurately check my gauge! Thanks for a great post! I love the idea of measuring gauge based on the width of a lace panel rather than number of stitches over 4 inches. Much easier!